Abstract: The Mongol invasion of Eastern Europe, and especially its sudden withdrawal from Hungary in 1242 CE, has generated much speculation and an array of controversial theories. None of them, however, considered multifaceted environmental drivers and the coupled analysis of historical reports and natural archives. Here we investigate annually resolved, absolutely dated and spatially explicit paleoclimatic evidence between 1230 and 1250 CE. Documentary sources and tree-ring chronologies reveal warm and dry summers from 1238–1241, followed by cold and wet conditions in early-1242. 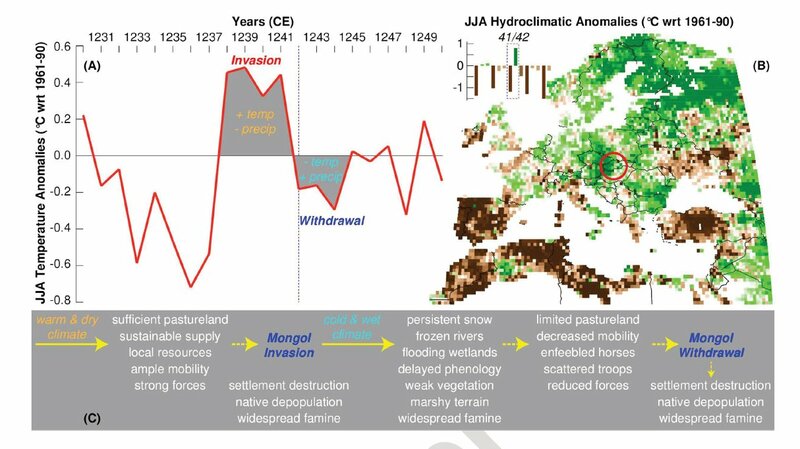 Marshy terrain across the Hungarian plain most likely reduced pastureland and decreased mobility, as well as the military effectiveness of the Mongol cavalry, while despoliation and depopulation ostensibly contributed to widespread famine. These circumstances arguably contributed to the determination of the Mongols to abandon Hungary and return to Russia. While overcoming deterministic and reductionist arguments, our ‘environmental hypothesis’ demonstrates the importance of minor climatic fluctuations on major historical events. Introduction: The Mongols began their expansion in the early-13th century CE, and by 1279 had conquered much of Eurasia including China, central Asia, Russia and Iran. Chinggis (Genghis) Khan (1162−1227), after being recognized as the sovereign of all Mongol peoples in 1206, led a series of victorious campaigns against the Jin dynasty in northern China, the Tangut state in northeast China and the Muslim kingdom of the Khwarezm in central Asia. A shift from slightly dryer to wetter climatic conditions in Mongolia after 1206 may have increased steppe productivity and thus have played a probable role in the buildup of Mongol power. Chinggis Khan’s death in 1227 caused a brief lull in the conquest but under the reign of his son and successor Ögödei Khan (r. 1229–1241), new campaigns were launched, first of all completing the conquest of north China.